As the second oldest city in South Carolina, Beaufort has preserved its Antebellum architecture and its classic Lowcountry scenery has provided a stunning backdrop to many of the films we love (Forrest Gump, The Big Chill, The Prince of Tides and many more). The Beaufort River wraps around the historic downtown which is filled with 18th-, 19th-, and 20th-century architecture, from tiny cottages and fish shacks to indigo-planters’ mansions with wide piazzas. 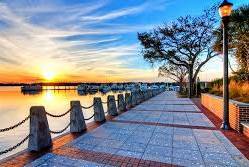 Beaufort consistently ranks as one of America’s Best Small Towns by Southern Living, Fodor’s, Smithsonian, and Travel & Leisure and is a perennial favorite in every “Best Places to Retire” list given the fantastic weather, abundant activities and relatively low cost of living.